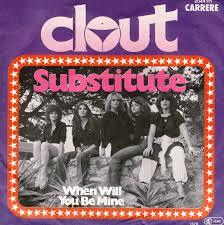 Clout’s ‘Substitute’ spent a second week at number 1, holding off the challenge of Wings’ ‘Mull Of Kintyre’ which dropped to 3 and faced a new challenge from Bonnie Tyler’s ‘It’s A Heartache’ which moved up 2 from 4 into second place. Debby Boone not only lit up our lives, but also lit up the charts as her hit climbed 10 places from 17 to 7 to take the climber of the week award. This was the 75th time we had seen a song climb 10 or more in a week with 8 of those times now being by songs by solo female artists. The second biggest climber was The Bee Gees’ ‘How Deep Is Your Love’ which moved up 7 from 13 to 6 to give them their 20th star rater climb. They were still in second place for number of star raters and now just 3 behind Tom Jones who led the way. Peter Allen’s ‘I Go To Rio’ climbed 5 from 19 to 14 and Uriah Heep’s ‘Free Me’ moved up 4 from 8 to 4 to be the other 2 star rater this week. The songs at 9, 10 and 11 all dropped 4 places to get there and these were the fallers of the week. Margaret Singana’s ‘I Never Loved A Man (The Way I Love You)’ ended up at 11, Kelly Marie’s ‘Run To Me’ landed at 10 and previous chart topper, Heart’s ‘Barracuda’ dropped to 9. The oldest on the chart was still Joe Dolan’s ‘I Need You’ which now sat on 16 weeks and had been the oldest for 4 of those. There was only one song leaving the chart this week and that was Thelma Houston’s ‘I’m Here Again’ which lasted 8 weeks and peaked at 9. Unfortunately for her, she would not be able to repeat the title of the song as this would be her last SA chart action. She had managed 2 hits, enjoyed 26 weeks in the top 20 and her best peak was the 3 weeks ‘Don’t Leave Me This Way’ spent at 1. 5000 Volts chalked up their 4th SA hit as ‘Can’t Stop Myself From Loving You’ entered the charts at 19 this week. The song appears to be a cover of a number 2 hit in Australia in 1974 for William Shakespeare (no not that one, but a guy called John Stanley Cave who went under the Bard’s name) which was written by Harry Vanda and George Young. The song writers name would be familiar to fans of John Paul Young as they had penned all his hits that had charted in SA to date. The Volts failed to chart elsewhere with this song, save for a number 18 peak in neighbouring Rhodesia. This entry was posted in 1978 and tagged Clout, SA Top 20, South Africa, Springbok Radio, Substitute. Bookmark the permalink.